Psychic readers all have their own ways of getting information during a reading, and I’d like to share some of my process. 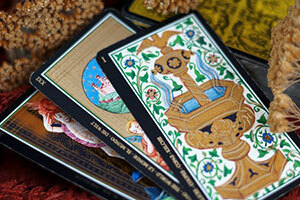 I use Tarot cards to get started. The spread I use is one I developed based on one I saw in a book, which I expanded to give me the most information. A brief pay-per-minute reading is typically far too short to go over everything I get from the spread, but it gives me all the information I need to answer the original question of the client. If time allows, a few follow-up questions, or even another question, can also be answered from the spread. For short readings it’s always easier to start with a specific question, preferably one that can be answered with a “yes” or “no.” If there is no specific question, I can only read the cards as they lay, listening to my guides to show me the way. While I’m laying the cards out, I’m looking for specific cards, in specific proximity, that have specific meanings, and combinations that have specific meanings. It’s a lot of information to take in as fast as I have to take it in, and once in a while a card will pop up that doesn’t seem to fit, until the follow-up, or additional question. Sometimes I pause for a second or two, because I need to process what my guides are saying. My guides are invaluable to me. They frequently show me mental images to remind me of an event, or a person, or a time in my life, or in the life of someone I know. I can then use that vision to explain what, or why something is happening, or what should be done. Other times my guides will repeat a line of a song in my mind, or a verse from one of the many books I’ve read over my lifetime, from Stephen King to The Bible. No matter what they’re showing me, or telling me, it’s always relevant. During a reading I see your life as a mental snapshot: where you are, and how you got there. Then I look for patterns, and based on that I can tell you the probable outcome. But due to free will the probable outcome always depends on what you choose to do in the end – and what you will decide to do is something I cannot predict. If you continue doing what you are doing, it’s easy to see where you’re headed, but if you decide to change something, it will affect the outcome. The principle is simple. If I tell you “do not text him for at least a week” and you text him two days later, my prediction probably won’t happen. If you want the outcome to change, I can tell you what to do, but I can’t make you do it. I’m not a “feel good” psychic. I don’t sugarcoat anything, and sometimes you won’t like what I tell you, but if you don’t like my answer, we can always look at how to change it.